It's market leading and patented software enables it to be used on liquids, where there is <12% air bubbles in the liqiud flow. The "clamp on" capability means that it can be fitted to the outside of a pipe. It is ideal for surveys, but it also allows installation of a more permanent flow measurement, without having to shut down the manufacturing process. A single set of sensors can be fitted to pipes with a minimun diameter of 13mm and a maximum diameter of 300mm. 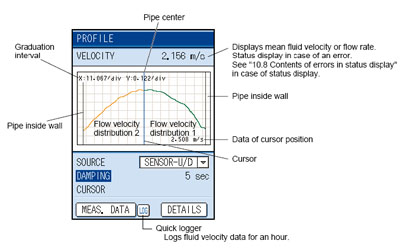 The portaflow's display also acts as a data logger, storing data to a standard SD memory card (CSV format). This allows data to be transfered to a PC for analysis. To assist with surveys, the display can be preprogrammed by the user with a number of survey meter locations. This stores specific installation information making life easier on the day of the survey. 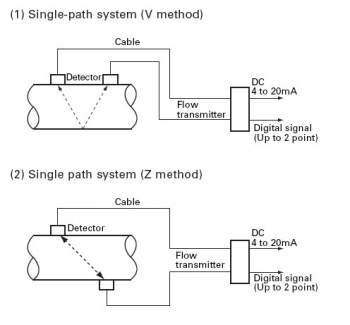 The Portaflow-C flow meter is a non intrusive, non evasive clamp-on ultrasonic flow meter, which is suitable for measuring the flow and total flow of liquids in closed pipes. It is particularly useful where high accuracy is required and the flow meter needs to be installed without shutting down the process. 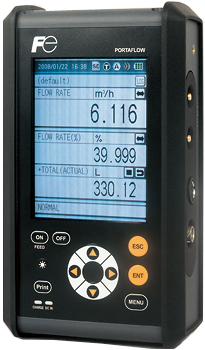 The Portaflow C is the latest release in the Fuji Electric flow metering range and uses the Micro processor and digital signal processing technology to provide a compact, lightweight solution with accuracies that are better than 1% of Flow rate. Portaflow is quick and easy to set up and is ideal for flow surveys. if you need an ultrasonic flowmeter for hire, Portaflows allows you to try before you buy at competitive weekly or monthly hire rates. For more details on hire charges Why not call us. Ideal for Water, diesel and heating oil. Compact and lightweight -Size and weight have been reduced by 30% in comparison with the previous model - now only 120x210x65mm and 1 Kg ! The above fluids can be measured over a wide range of process conditions including very low and very high pressure. 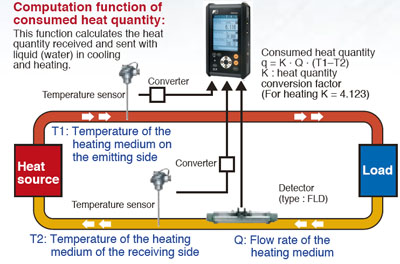 Fluid temperatures can also be on a range of -40 to +200 deg C.
The Fixed version from Fuji Electric, with advanced features such as the Anti Bubble Measurement system.